The Fransgard Professional Series Leveller Blade from FarmTech offers a number of features to facilitate effective operation. This leveller blade is driven by hydraulic cylinders that permit the user to rotate the blade 180 degrees or offset it. A high mouldboard makes it possible to haul material to create beds or piles. 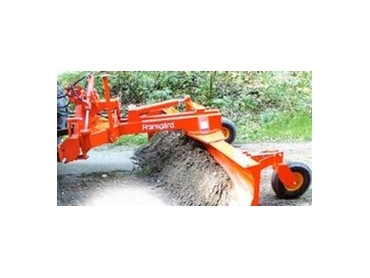 The Fransgard Professional Series leveller blade has large gauge wheels with floatation tyres that can be adjusted manually, and is supplied with a wear strip. The leveller blade wear strip is reversible and has plain and serrated edges. The Fransgard leveller blade wear strip is also available with both sides plain, both sides serrated or in rubber.